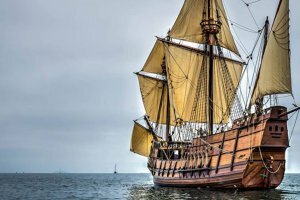 A San Diego 250 commemorative event inspired by the arrival of the Spanish sailing ship, San Antonio, into San Diego Bay 250 years ago to the day. The event brings together the Kumeyaay Nation, public officials, the Maritime Museum and honored guests to share in marking the day that San Diego began. The Maritime Museum’s San Salvador ship will serve as an impressive backdrop to the beautiful gazebo location in Embarcadero Marina Park North. Short presentations and cultural exchange activities will begin at noon, lasting approximately 30 minutes. Educational information panels, light snacks, refreshments and seating will be provided in a covered area adjacent to the gazebo. This event is free to the public. Learn more about First Port, First City. July 16, 2019: Honored guests, officials and the Kumeyaay Nation will gather atop Presidio Park, to honor our past and envision our future during a civic ceremony to commemorate our shared history. The event will feature a press conference, dedication of Kumeyaay flag, VIP tour of new exhibits, entertainment and refreshments. September 14 & 15, 2019: Rich in heritage and bursting with opportunities to explore, Old Town is not only historically significant, but provides the perfect location for guests to fully immerse themselves in San Diego’s history and celebrate the future. The weekend-long Founders’ Day Festival will feature entertainment, vendors and activities for the whole family.